A film written and produced by the director of Māoriland Film Festival is to have its world premiere in Toronto at the imagineNATIVE Film + Media Arts Festival. The Gravedigger of Kapu was written and directed by Libby Hakaraia and filmed at Te Pou o Tainui Marae in Ōtaki. 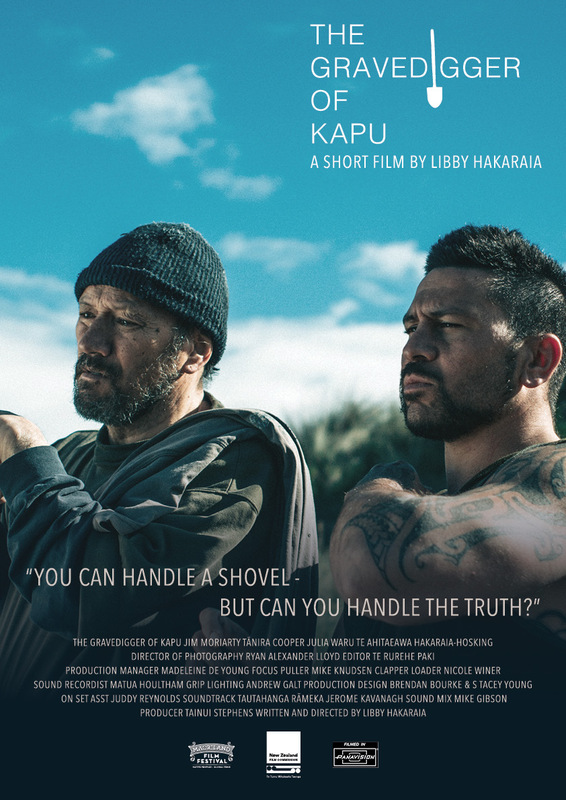 Libby and producer Tainui Stephens successfully found support from the New Zealand Film Commission’s Fresh Shorts film fund for THE GRAVEDIGGER OF KAPU. This fund is highly contestable and includes development support from some of New Zealand’s best writers, producers and directors. THE GRAVEDIGGER OF KAPU stars film, television and theatre actor Jim Moriarty and Ōtaki’s Tanira Cooper in his first ever screen role as Tana. Tanira is a teacher at Te Kura ā Iwi o Whakatupuranga Rua Mano. “It is important to me that the film was authentic in both its story, its setting and in the people who bring the story to life. Tanira is my cousin and I am very proud of his performance which is in part, informed by his own life journey. Jim Moriarty is a masterful actor and was able to share some of his decades of acting work with Tanira. Together they were magic to work with.” said Libby. Most of the film takes place inside a series of graves and follows the older man Hone trying to share his knowledge with his apprentice. But Tana is nervous about taking on the spiritual weight of the Gravedigger role. It is the second short film written and directed by Libby at her Ngāti Kapumanawawhiti marae in Ōtaki. Her first film THE LAWNMOWERMEN OF KAPU has screened at more than 25 festivals around the world. To have THE GRAVEDIGGER OF KAPU selected for the imagineNATIVE Film + Media Arts Festival which opens this week in Toronto, is no small feat. Over one thousand short films were submitted to the festival. To secure a place in this prestigious festival is a significant achievement and is certain to be followed by other invitations to screen around the world. This week the renowned Berlin Film Festival also asked to see the film. Libby is traveling to Canada with the support of the NZFC to celebrate the film premiere of THE GRAVEDIGGER OF KAPU. In her added role as the Director of the Māoriland Film Festival she commissioned four NATIVE SLAM films earlier this year that screened at the MFF. These four films have also been selected to screen at imagineNATIVE. SUFFRAGE 2043	Māoriland Film Festival seeks Indigenous filmmakers from across the globe for the fourth annual NATIVE Slam!